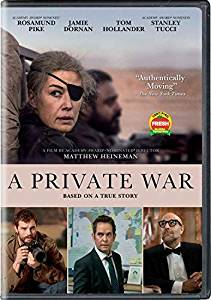 One of the most uncompromising war films in recent years, A Private War centers on the true-life exploits of Marie Colvin, an American journalist reporting from the world’s most dangerous hotspots for the London Sunday Times. Rosamund Pike, Oscar nominee for Gone Girl, portrays Colvin, an incredibly resourceful correspondent whose fearless reportage earned her fame and awards, but whose private life was essentially a mess. In order to deal with her overwhelmingly stressful job, Colvin anesthetized herself with heavy booze and random men, while sporting a trademark eyepatch she “earned” after losing an eye in an altercation in Sri Lanka. Making his feature debut, documentary specialist Matthew Heineman, (Cartel Land, City of Ghosts) should be applauded for not sugar-coating Colvin’s gung-ho story (which was chronicled in a Vanity Fair article that the film is based on). The constant threat of horrific violence follows Pike’s character through the entire film. 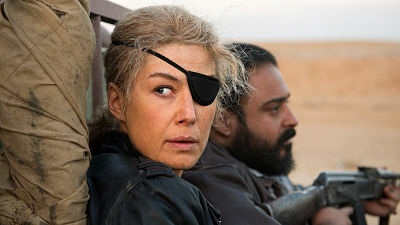 This makes A Private War an uncomfortable experience throughout, as a feeling of dread permeates this well-made and realistic film that is a genuine downer. Adding a glimmer of levity to the proceedings is the relationship depicted between Colvin and her trusty photographer (Jamie Dorman, 50 Shades Free), and, in a brief bit, the always reliable Stanley Tucci (The Hunger Games) as Colvin’s most grounded lover, a stylish (albeit fictional) wheeler dealer. Despite strong reviews and Oscar talk for Pike, the film stalled after taking in a light $1.7 million at the box office during its limited release. But the public’s ongoing key Interest in war films, Pike’s recent ascendance to leading lady status and critical kudos will likely help A Private War find post-theatrical followers.